It started with a Tri-ang TT gauge tank locomotive, three coaches and seven wagons my father found early in 2000 in a box. I fondly remembered playing with them as a child and even then they seemed to me to be the perfect size. I’m not sure how they went missing for 40 years but it was great to see them again. By coincidence, at the time of the find, I had been thinking about fulfilling a long-held ambition by building a model railway, inspired by a visit to the permanent exhibition in York, and was trying to decide between OO and N gauge, which seemed to be the only realistic options. But I didn’t really have room to do justice to OO, and N looked a bit fiddly. That TT find looked perfect…however, there was no track, no station, in fact nothing apart from the stock. Maybe I should put them in a showcase and leave it at that? Still, I thought, I can’t be the only person in the world with the remnants of a Tri-ang TT train set, maybe there are some enthusiasts I can contact over the internet. What was I thinking? It didn’t take long to find the 3mm Society’s website and to get a few reassuring replies from some of its members. It seemed that just about everything I needed for a 3mm layout was available without involving too much scratch-building. So I did end up deciding between OO and N – I went for something exactly in the middle! 3mm scale is the contemporary name for TT, or table-top, which Tri-ang introduced in the late fifties. It was smaller than OO and, owing to the small minimum track radius of a little over ten inches, it enabled a small oval layout, say five feet by two feet, to be easily fitted onto a table top. The size of the trains equates to a scale of 3 millimetres to one foot (the odd mix of metric and imperial being a quirky feature of the UK model railway world in general), or to a ratio of about 1:100. 3mm scale is therefore about three quarters the linear size of the more widely used OO but 50 percent larger than N. This means you can get roughly one and three-quarters as much layout as you can with OO into a given area, or build a similar layout in less than 60 percent of the space. So for example, a layout that would need an area 8 feet by 4 in OO will only need 6 feet by 3 in 3mm scale. The 3mm Society, along with a handful of small traders, is the hub of 3mm modelling. Loco, coach and wagon kits, track, wheels, motors, simple building kits and a wealth of scenic and ancillary components are all available such that with a bit of time and effort, realistic working 3mm scale layouts can be made, to finescale standards if required. For the nostalgic or less demanding modeller, a limited range of original Tri-ang stock and components and early pre-built kits is also available. 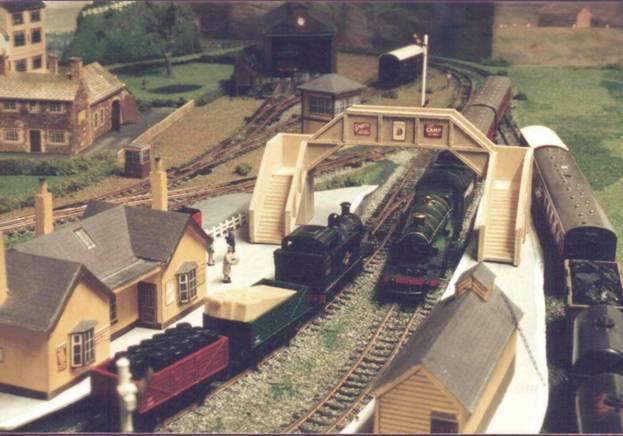 As I didn’t know anything about real railways at the time, Briargate was built with no particular region in mind. Later, to add operational interest and give credibility to the oval track format, I invented the Bradford-York railway, which ran in a two-way loop, connecting Bradford, Leeds, Briargate, York, Knaresborough, Harrogate, Yeadon and Shipley, then back to Bradford. For a Yorkshire railway, it certainly had an odd mixture of stock. Alas, the model, like the real thing, is now defunct. It was going to have to be small and simple (just like me really). I knew nothing about prototype train operation but I wanted enough room for two continuous loops, a station, an engine shed, and some sidings for a bit of shunting. There would be some kind of village or town backdrop. The baseboard measured about 5ft x 3ft, made from three equal sized pieces of chipboard I found in the garage belonging an old wardrobe, laid side by side and screwed together using three pieces of 2 by 1 lengthwise (also to hand in the garage), with cork sheet from my model shop stuck on top with Evo-Stick and painted with mid-brown emulsion (from that garage). I cut V-shaped grooves into the 2 by 1 every so often, as advised by the experts, for wiring to pass through. There were no legs, it simply rested on a desk in what we aptly call our play room. I used track from the 3mm Society. This comes as separate 18-inch lengths of rail and sections of plastic sleeper base made for the Society by Ratio. Threading the rails through the sleeper bases was not the most pleasureable of tasks and I ended up with sore thumbs, but my then nine-year-old daughter gamely helped and we got the job done over three or four bursts. 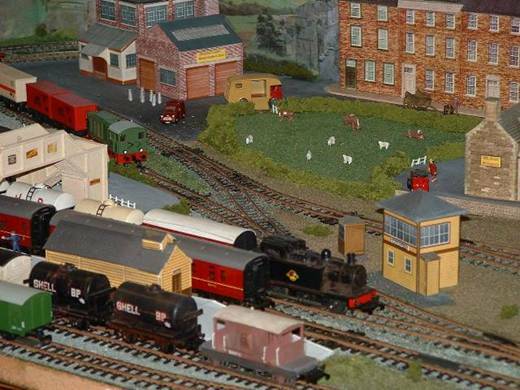 I used two sets of hand-made points from 3mm Scale Model Railways (one of several 3mm scale traders), which are beautifully made but need individually wiring and switching to change the frog polarity. For the rest, I decided to go for Peco HOm points, which require no additional wiring. They fitted to the track quite well despite the slightly different cross section. The sleepers look slightly heavy compared with the Society track, but not too bad when ballasted. I had problems running Tri-ang locos through them and shaved bits off the plastic check rails to remedy this. Had I known at the time, however, I could have avoided this by slightly adjusting the back-to-back measurements of the loco wheels. Never mind, I know now! Laying the track was the most traumatic part of the whole thing, what with getting the curves right (more or less - I found I had to make lots of cuts in the sleeper joints, and flex the rails quite a bit to make them retain their ‘bend’ and avoid dog-legs) and mucking about with N gauge fishplates as recommended by the 3mm Society. These are too narrow and eventually I switched to the bigger Peco HOm fishplates - much better. I bought a track cutter, which was indispensable. The track was temporarily placed with drawing pins in between the sleepers, then stuck down at intervals with PVA over the sleepers, pending ballasting. No track pins were used. I used dark brown acrylic paint to weather the rails – I found this a chore, so I did the visible side only. Ballasting was quite fun but the grey Javis chippings I used turned a sort of grey-green after the dilute PVA had set. Another lesson – this is apparently caused by chemicals in the washing-up liquid mixed in as recommended by the experts to free the surface tension of the mixture. And of course I got some of the points jammed up with grit and glue and had to free them up to get the electrical contacts working again. The final job on the track, one of the last on the whole layout, was to install uncouplers at strategic points. I made these out of transparent flexible plastic packaging material and glued them into slits cut in the ballast. They were hardly visible and worked very well. There were three main feeds, one on each loop and one for the spur in the sidings, using a twin controller. 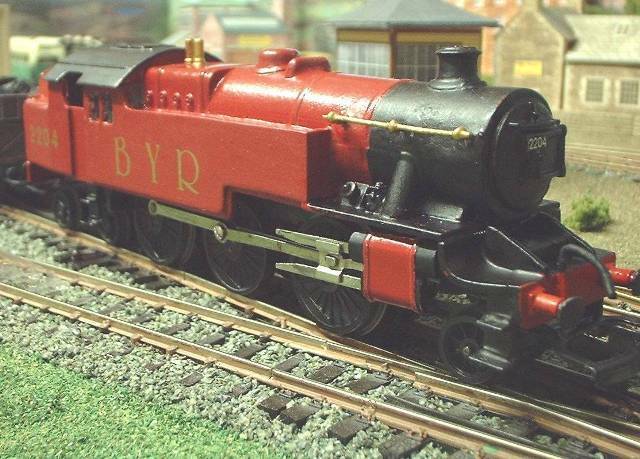 I did this before ballasting, soldering the wire underneath the rails and passing it down through holes in the baseboard. I made use of the self-isolating nature of the Peco points to prevent unwanted movement of locos in the sidings, but when everything else was more or less finished I decided I wanted to isolate a few more sections to allow more flexible movement. This meant drilling holes through the ballast and soldering more wire, this time to the sides of the rails, but after a bit of touching up it was hardly noticeable. I used small toggle switches to turn the isolated sections on and off. The buildings were either scratch-built or 3mm scale Bilteezi. I just about went for the works here - dairy, Georgian houses, row of shops, tunnel, engine shed, country station and signal box. They are hardly the last word in realism but they are certainly cheap and look quite good with a bit of weathering – and without them I don’t think I would have even started, since having to scratch-build everything would have put me off. Since I built the layout, the whole range of Bilteezi OO scale kits has become available via Messrs. Finney and Smith, reduced to 3mm scale. Scalescenes also make a range of excellent building kits, downloadable from their websiteat a very reasonable cost and printable in 3mm scale by adjusting printer scale settings. I had fun playing around with the names of the traders – thus we had Messrs. Curdle and Churn running the dairy, W. Irons the blacksmith, the Pricey and Posh Department Store, Boot and Lacey footwear, I. Shearem Hairdresser, and the Frog and Fishplate Hotel. I made the new signs using MS-Word, printed them out onto plain paper using an inkjet printer and simply cut them out and stuck them over the existing ones. The backscene was a piece of hardboard the length of the baseboard and 9" high (guess where I found it?? ), painted sky colour. I then applied white paint with a sponge for the clouds. To this I stuck scanned photos from a book about Yorkshire, with the Bilteezi shops, houses and dairy in front. A Great Western milk van in Yorkshire? Some mistake surely! I scratch-built the platforms, footbridge and level crossing ramps from thick artist's mount card, painted with poster paint or enamel and weathered with pastels, rubbed in with brush or finger. With 3mm you can’t really get away altogether without scratch-building but once I’d started I found it really easy (though I already had piles of card, the paints and the pastels so I didn’t have a big shopping list – but these things are easy to get hold of anyway and not expensive). The brickwork around the platforms is from a scanned and reduced photo of real bricks. The crossing gates were taken from a Tri-ang crossing supplied by 3mm Society Secondhand Sales. The roads were painted with poster paint and weathered with pastels. I used Javis scatter materials for the fields and the hill over the tunnel, which was made from expanded polystyrene covered with filler. There were a couple of Tri-ang signals from 3mm Society Secondhand Sales with Society ladders added, and a coal staithes which I scratch-built from Wills OO sheets. The people are also from the 3mm Society. Not everything you see on the layout would have been suitable for a Yorkshire railway, it’s a case of what I could get hold of quickly at the time. The original Tri-ang 0-6-0T was soon supplemented by a Tri-ang Castle, a pre-built white metal 94XX body kit on a Tri-ang chassis and a 3mm Stanier 2-6-4T body kit, again on a Tri-ang chassis, later replaced by a Society nickel silver chassis with Romford wheels. Passenger services were by two Tri-ang BR Main Line coaches and one Kitmaster, which like the Tri-ang ones had survived 40 years, albeit a bit battered. With the aid of a few bits and pieces from 3mm Society colleagues, I restored it to reasonable condition. The original seven miscellaneous Tri-ang wagons were gradually supplemented by the excellent 3mm Society wagon kits. I couldn’t resist buying extra Tri-ang items too, and the dairy ended up being served by six milk wagons – two for each cow in the adjacent field. 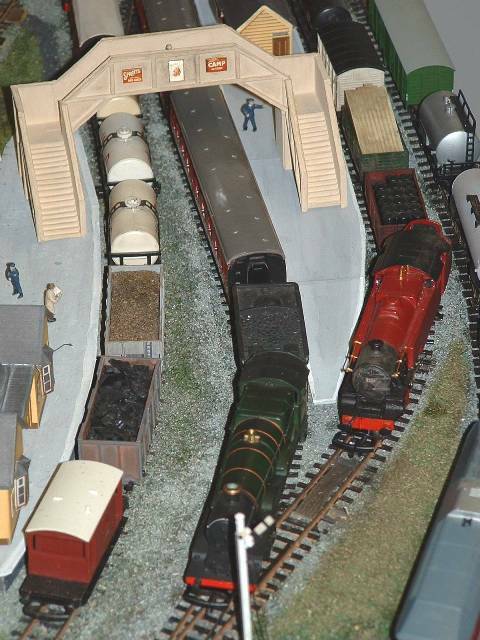 I have to say that various interlopers started to appear on the layout in the form of continental TT locos and stock. They definitely looked interesting on what was intended to be a British layout, besides being to 1:120 scale rather than 1:100, but I couldn’t resist buying them, and they run extremely well. 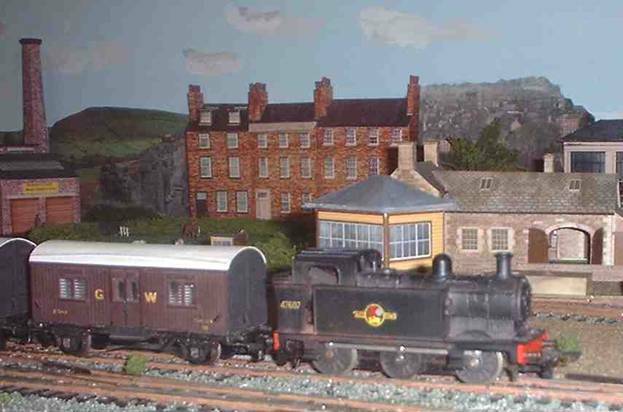 The two years or so between May 2000 and May 2002 taught me a lot about model railways. To an extent I did things the hard way by going for 3mm first off and of course I made lots of mistakes. The ballast was not as even as I would have wanted. I didn’t take enough care with the curves and track spacing so that with certain combinations of stock, collisions and derailments happened. 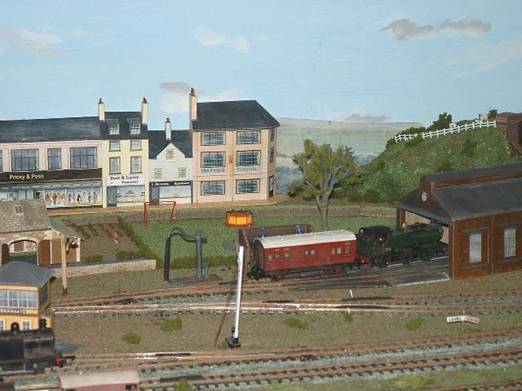 With this first layout I proved to myself (and hopefully to others) that it’s possible to build a realistic layout in what many consider to be the ideal model railway scale. I was pleasantly surprised at how cheaply it can be done. I had lots of fun into the bargain, and made the acquaintance, both electronically and in person, of a great bunch of 3mm-ers, whose help was indispensable.